In an interview given to Katarina Kuai from the Natural Resource Governance Institute (NRGI), Dr Carole Nakhle, Director of Access for Women in Energy (AccessWIE), spoke just before the International Women’s Day on the growth of AccessWIE, the “anemic” female participation in the extractives sector, as well as the roles NRGI can play in addressing gender inequality and women’s empowerment. Katarina Kuai: How has AccessWIE grown since 2016, when you last spoke with us about the organization? Dr Carole Nakhle: AccessWIE has grown significantly over the last two years, not only in terms of membership but also in terms of activities and international reach, thanks to the continuous support of its leadership, its dedicated Management Committee who volunteer to support the group and, of course, active members who share our values and beliefs. Perhaps the most satisfying achievement was helping to set up similar groups in Ghana and Tunisia. In Tunisia, the appreciation of women’s expertise—particularly in the energy industry—was remarkable and personally moving. Being involved in Abu Dhabi’s flagship event, ADIPEC’s Diversity in Energy conference, was another memorable achievement. We are also collaborating with Women in Energy Program at Columbia University in New York and we hope to strengthen our engagement with NRGI in this sphere. How have the trade missions led by women you cited as an AccessWIE priority been going? The Energy Trade Mission was our then-new experiment for 2017. A group of energy experts, a majority of them women, travelled to the UAE and had a busy schedule of meetings with officials, industry and institutes involved in the energy sector. The mission was highly informative. 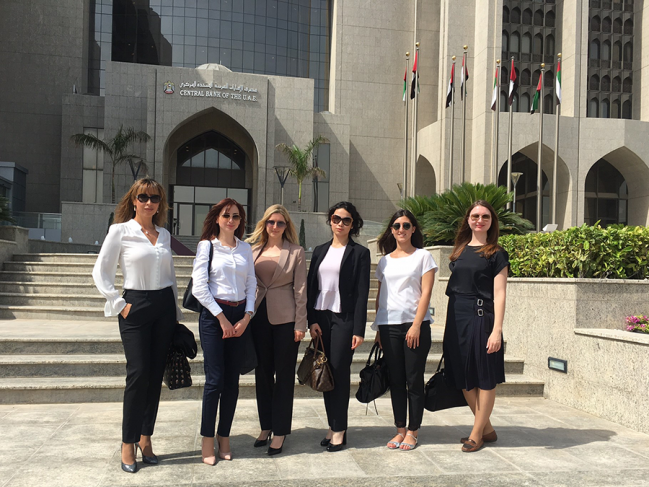 We all learned a lot about the energy industry and policies in the Emirates and, equally important, about the serious dedication of the government and its organizations, particularly national oil company ADNOC, to promote the role of women in the sector. This goal pleasantly surprised all the mission’s delegates. This year, we are planning a similar mission to Lebanon. Although I enjoyed every aspect of the mission, the sweetest memory is of all the delegates—from an English Lord to a businessperson, to a Ph.D. student each coming from different countries, sharing experiences, views, food and drinks, while heading from one meeting to the other. By the end of the four-day mission, background and gender were simply meaningless. We’re keen on repeating it every year. We’re seeing large cultural shifts on gender around the world. How is that playing out in the extractives industry? Despite the international enthusiasm about gender diversity, the participation of women particularly in the energy industry remains anemic, and it shrinks further in higher echelons. Again and again, I attend industry conferences dominated by male speakers and participants, and they feel so out of touch with reality. When one raises this point, the excuse that is typically given is, “We cannot find female speakers.” The answer should then be, “You haven’t looked hard enough.” First of all, there are many female experts in the industry. Yes, they’re outnumbered by men. But they are there. Second, such an attitude does not help in attracting female talent. I recall an energy dinner discussion I attended where one businessman was talking about his board’s longstanding intention to hire a woman; he proudly said that he and his colleagues have raised this matter almost each time they met, but, as he claimed, they couldn’t find any. During that dinner, there were nine guests; six are established female energy experts. Today, the oil and gas industry is facing many challenges, some rather existential. The longevity of the industry will depend on the supply of well-educated and experienced employees, both male and female. Any great industry, such as energy, or any society or economy trying to advance while favoring only half the workforce over the other is bound to stagnate. How do you see the role of NRGI in addressing gender inequality and women’s empowerment? NRGI presents itself as helping “people to realize the benefits of their countries’ endowments of oil, gas and minerals.” Addressing the issue of gender inequality in the sector has many positive spill-overs, which I can only see complementary to that mission. NRGI could carry out comparative research on the participation of women the extractives across various countries to provide a better understanding of barriers and practices in different regions. Isn’t it strange that in an industry more than a century old, there are few female energy ministers and few oil companies, private and state-owned alike, with a female CEO? This is a widespread global occurrence across industries, but are the causes the same? It would be interesting to find out. The interview was first published in the Natural Resource Governance Institute and it was in NRGI’s top 10 most read publications for 2018.